In an industrial environment, forklifts are the chief issue when it comes to protecting workers afoot, but mobile stackers, Cushmans, tow tractors, mobile order pickers, AGV’s, and other vehicles can also cause grave safety concerns. There are challenges when it comes to the sheer diversity of operational types, situations, and specific problems in a given facility, and that’s where ZoneSafe shines. We’ve shared what OSHA has to say about forklift accidents before and it mostly comes down to better and more frequent training. Focusing primarily on training is a good start, but for many companies and the variety of difficult areas present in them, training is often unable to cope. The stress of fast-paced operations in difficult settings can overwhelm a driver’s training or a pedestrian’s awareness. We’ve broken down a number of these specialized situations: managing traffic in areas like loading docks or robotic workcells isn’t easy. Sometimes these areas require that traffic be dealt with from multiple angles, out of sight from each other. Many companies have created a variety of safety systems that cope with these issues. AisleCop® systems utilize motion detection, intelligent controls, gates, and warning lights. There are a variety of sensors that mount on racks, ceilings, walls, etc. There are also traffic lights, AisleAlert Forklift Safety Warning Systems, floor projectors, and simple blue forklift safety lights. All of these are excellent safety enhancements that help make facilities safer by raising awareness for both drivers and pedestrians. Even simple guard rails can be essential when it comes to protecting people, machinery, etc. in forklift areas. All these systems help raise awareness and reduce the chances that a distracted driver or busy pedestrian will make a devastating mistake. Having diverse locations with risk-filled situations is where ZoneSafe can be applied and really shines. The system can essentially be set up in just about any area without installing sensors, gates or railing. This provides extensive flexibility, as a ZoneSafe project can be configured a number of ways, for a number of situations, and easily scales to cover those diverse situations you have (you can tag any number of workers and install control modules on any number of vehicles). ZoneSafe also works outdoors, for areas like ports, pipe yards, loading docks and other outdoor areas where people and vehicles mix. 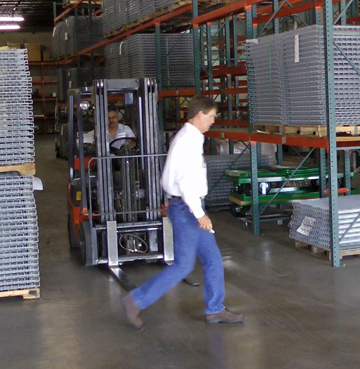 They integrate with gate systems, so you can designate how and when a forklift might enter a protected zone. Flexibility in protected zones is a key way these systems allow you to fully utilize the system. 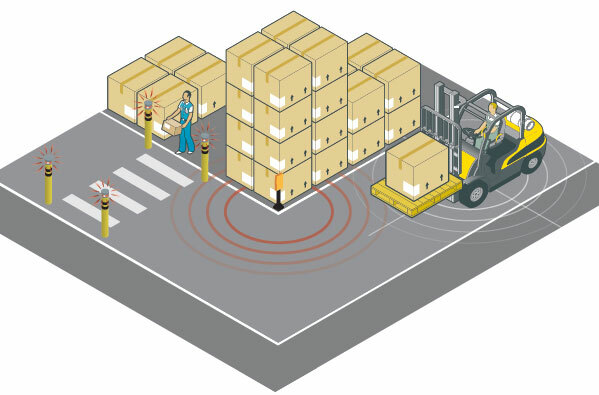 With ZoneSafe, you install an antenna on your forklift(s), which detects a person, gate or other asset once the vehicle reaches a certain, preconfigured distance from the object. The system accomplishes this with a tag, worn by people or installed on other assets. You adjust the detection zone to fit your needs, 3 to 9 meters from the vehicle. This ability to finely adjust the zone helps add even more versatility to the system. Along with standard functionality, customized installations that integrate the simple tag/control system with various plant equipment is also possible. Since all of these systems have their place, it’s proper to look at your application, traffic flow patterns, volume of traffic, and specific needs. We can help you get started.